Walking into McCormick Place, Chicago’s half-hangar, half-labyrinth convention center, I looked at the schedule to find that I had just missed “Canadians Do Cremation Right.” The 130th National Funeral Directors Conference, was underway; held each year in a different city, the conference brings together funeral directors from across the country for three days of presentations, trade talk, awards and camaraderie. After shaking off my initial disappointment at having missed the Canadian talk, I scanned the remaining workshops. After passing on “Marketing Your Cemetery: Connecting With Your Community” and “Managing Mass Fatality Situations,” I circled “The Difference Is In The Details,” an embalming workshop. The funeral industry is in the midst of a transition of titanic proportions. America is secularizing at a rapid pace, with almost 25% of the country describing itself as un-church. Americans, embracing a less religious view of the afterlife, are now asking for a “spiritual” funeral instead of a religious one. And cremation numbers are up. Way up. In liberal, secular states, specifically in the Pacific Northwest, cremation rates have steadily increased to more than half of disposals, up from the low single digits in 1990. The rest of the nation had also experienced steady gains in cremation since 2000 (except in the Bible Belt, where cremation rates remained relatively low). The rate of cremation has skyrocketed as Americans back away from the idea that Jesus will be resurrecting them straight from the grave. And so in the past twenty years, funeral directors have had to transform from presenters of a failed organism, where the sensation of closure is manifest in the presence of the deceased body, to the arbitrators of the meaning of a secular life that has just been reduced to ash. Reflecting this trend, this year’s NFDA conference was, for the first time in its history, held jointly with the Cremation Association of North America (CANA). Talking with funeral directors at the conference, I began to realize the scope of the crisis spurred by the rise of cremation and its new importance. As one former funeral director said, “If the family wanted a cremation, we’d say ‘That’ll be $595,’ hand them the urn and show them the door. Not anymore though.” The industry is scrambling to find a way to add value-added cremation services to remain solvent. This tension about how best to innovate was in evidence at the first presentation I attended, titled “How To Step Up Your Game.” The presenter worked for a consulting firm that specialized in business strategies and management — the funeral industry was his particular subject of expertise. He launched into his talk with a story about a recent trip to Disney World with his daughter. While walking through the park, he realized how much the funeral industry could learn from the attraction. At Disney World, every interaction had been scripted and rehearsed, down to the greetings from the custodians. Experiences are controlled. Likewise, he said, every funeral should offer the same experience for everyone, whether cremated or open-casket. If, say, the customer was having an open-casket service with a priest and an organist, there should also be a corresponding service for someone, possibly secular, who has just been cremated. If priests are no longer always present to say platitudes over the dead, funeral directors would have to develop a corresponding basic, secular service to stand in as a reverent farewell. Thus they’d take a much larger role in the memorial, acting more like mainstream event planners and offering such amenities as video tributes, arranging for music and other points of the new-age burial. As he clicked back and forth between a picture of an old-fashioned, stuffy, sunless viewing room, replete with heavy velvet curtains and faux-gold candelabras, to the new, health-club-reminiscent Remembrance Room, it became clear: the funeral industry is being gentrified. “No more outsourcing the healing to ministers, because that isn’t really going to work anymore,” the presenter continued. Religion answered the question of authenticity, the sense that the memorial was genuine and prescribed. The minister, God’s shepherd, was on hand to see the soul to heaven. But in a society that has grown suspicious and distant from religion, this no longer is sufficient. Now it’s up to the funeral directors to provide that sense of authenticity, of closure, a way to deal with the impossibility of understanding death. The presenter continued with a slideshow of forward-looking funeral homes: huge windows with sunlight streaming in, glossy ceramic tables holding both the urn and catered health food — they looked not unlike high-end yoga studios. As he clicked back and forth between a picture of an old-fashioned, stuffy, sunless viewing room, replete with heavy velvet curtains and faux-gold candelabras, to the new, health-club-reminiscent Remembrance Room, it became clear: the funeral industry is being gentrified. I looked around the room. The audience was incredibly diverse, which, was true of the conference overall and which makes sense: every community has its own funeral home, each with its own loyal followings, its own special services that a cross-town rival doesn’t offer. But here they were, being told to act more like Disney World, and everyone was taking notes. 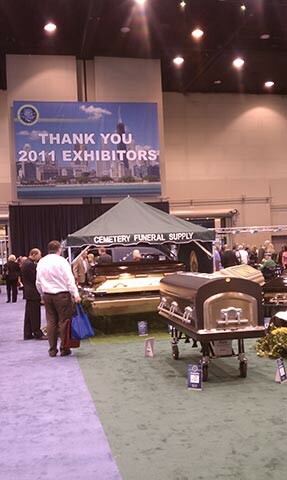 Meanwhile, on the floor of the trade show, the entrepreneurs were clearly betting on cremation’s continued rise in popularity. The floor held booths for hundreds of vendors, selling everything from health insurance to back hoes for grave digging. 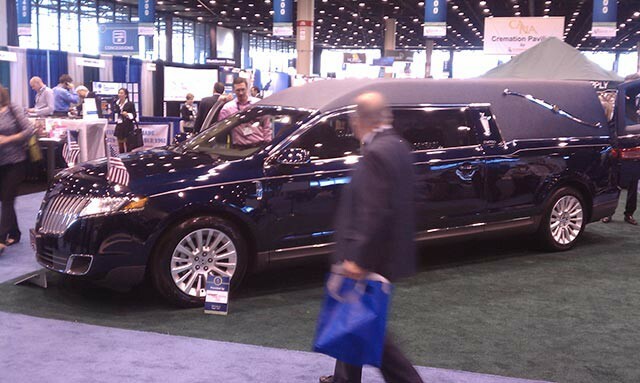 At one point during the weekend, a red ceremonial ribbon was cut and the tradeshow curtains parted to reveal a new line of hearses. But by far, the largest contingent of vendors were hawking cremation-related products: urns with Bible verses on them, urns with dolphins flipping in front of a Lisa Frank-style sunset, rings with diamonds made of ashes, and an iPhone app that lets you know the progress of a cremation. Funeral homes have to invest in the equipment that will guarantee a solvent future and the funerals-peripheral industry, always with its ear to the ground, is entering the cremation game in full-force. For $150 you can have a pendant that can be worn from the neck, filled with the ashes of loved ones trapped in decorative glass. There are also options for our furry loved ones. As it happened, just as I approached the pet-urn section, my sister texted me to let me know her boyfriend’s cat had just died. I resisted asking what her plans for the ashes were, but was just then passing the eco-friendly cat urns, made to look like a ball of yarn. There were dog-bone urns, too. The young couple that was selling the pet-urns looked like they might have just as easily been peddling artisanal cupcakes. They told me they were sorry about the cat. Attending this event as an outsider elicits a mixture of morbid curiosity, a confrontation with your own mortality and beliefs — and, if you are a good consumer, an eventual conclusion as to what you’d choose for your own earthly remains. I made the decision about the disposal of mine when I came across a table with degradable urns that were also tree planters. A special soil unlocks nutrients from the ashes that eventually become part of the tree itself. That sounded just about right for me, and I will probably insist on being planted somewhere pretty (until, of course, I am cut down to make a baseball bat for my great-great-grandchild, a baseball bat that I guarantee will only hit home runs). Eventually, I reached the cosmetics section of the trade floor. Makeup, meant for corpses, was being applied by airbrush to a (still-living) elderly woman. She sat there on a stool, still and frail-seeming, eyes closed in the manner of anyone getting a makeover, as the presenter sprayed her with the makeup. No one seemed to consider this odd or in poor taste. Why would they? To those in the business of death, the distinction between the living and the dead is a simple matter of economics. Someone is much more valuable to them dead than alive, and the elderly among us are futures to be counted on for next year’s bottom line. I thought of the embalmer’s neighbor, the one with bruised hands. Who were we fooling? One day we will all die, and these people are the ones who will be paid to dispose of us. In this light, their preparation and commitment to self-improvement is both beautiful and professional. The coffins took up the next section of the floor. As with urns, coffins are easily branded to accommodate the former personhood of the body within. “The Waldorf,” a solid mahogany coffin, is for the “Business Leader and Family Man,” its accompanying flyer features a picture of a silver-haired Wall Street executive. Other coffin styles targeted other professions: “Sovereign Realtree” for a rancher and “A Man of The Earth,” “Westmoreland” for a school librarian, who was also “An Elegant Women” and the “Prescott” for the architect who was “straightforward, honest, no frills,” but taken too soon from us. (Although I have a sneaking suspicion that the architect will have chosen cremation.) 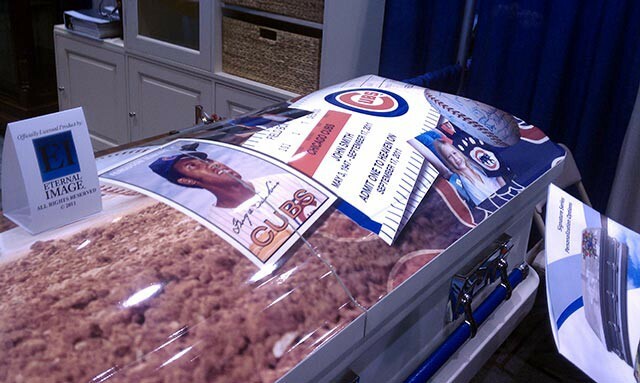 And of course there were the Major League Baseball caskets, so a Cubs fan can spend eternity celebrating that personal hell. On the far side of the floor, past the new hearses, is where the future began. Just as Playstation 2 is sure to come out right after you’ve bought Playstation, there’s already a cooler, better, more expensive form of cremation. While cremation is technically “greener” than burial, the burning of the body still releases into the atmosphere whatever you might have embedded in you — dental fillings containing mercury, a hip replacement made of plastic. 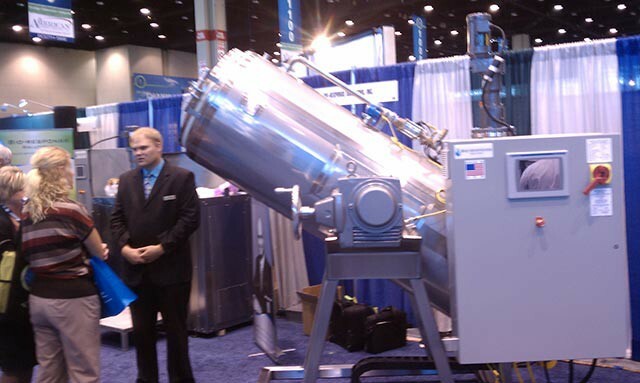 The newest, greenest thing is called “alkaline hydrolysis,” a process that uses sodium hydroxide (basically, lye) and extremely hot, highly pressurized water to rapidly speed up the process of natural decomposition. The body is placed in a large tube with a square control base (upon seeing a picture, a friend of mine commented that it looked a lot like a bong, and it kind of does), bathed in chemicals and highly pressurized, and in a few hours all that is left is liquid and ash. Just as Playstation 2 is sure to come out right after you’ve bought Playstation, there’s already a cooler, better, more expensive form of cremation. On that ominous note, I left the future and returned to the present. A man tried to sell me Thanoseal (for when a cadaver I’m embalming begins to leak). I passed earrings made from cremated remains, and a pavilion devoted to pre-made video tributes (all that’s left is to insert photographs of the deceased against the background of a golf course). She gave me the address of the bar where the bus would be dropping off the directors. By the time I got there the young directors were already bedecked in fluorescent necklaces and quite comfortably soused; I didn’t see any actual hooks-ups going down, but there was an inordinate amount of touching and hugging going on in the room, so maybe that happened later. I said hi to a few of the people I’d met and listened to a few “things I accidentally said in front of the Reverend”-type jokes, but I could tell I wasn’t all that welcome. And I knew why. For the directors there, this was their one night to be with others who, just like them, live among the dead. They could feel free to have a good time, far from their hometowns, far from company who expect them to only ever comport themselves with the highest dignity and attitude of reverence. The next day, on my flight home, I thought about how one of the people at that conference — maybe someone I had met, or maybe their son or daughter or apprentice — might be the last person to ever touch my failed body. I looked around the plane. Someone in one of these seats, snoozing, working on their laptop, will undoubtedly be tucked into a coffin or put into a cremator or even, one day, bathed in alkali by someone I just shook hands with or napped next to during the presentation on corpse hair-removal. The truth is, I’ve never been to a funeral. I’ve been fortunate in life that only grandparents of mine have passed away — neither parent, no friends, no teachers. Each time one of my grandparents has died, I’ve been too far away to be able to attend their funerals. I wish I’d known this then, but you can now videoconference in to a funeral, and witness the remembrances and recessionals, the condolences and appreciations, all of it floating through the digital ether as you sit and watch in a living room half-a-world away. For this type of service though you would need the Platinum Package, which would be an extra 400 dollars. But you can’t really put a price on that, can you? Max Rivlin-Nadler is a founding editor of Full Stop Magazine. He can be reached here.